The Radiance Foundation published an article online entitled “NAACP: National Association for the Abortion of Colored People” that criticized the NAACP’s stance on abortion. In response to a cease-and-desist letter from the NAACP, Radiance sought a declaratory judgment that it had not infringed any NAACP trademarks. The NAACP then filed counterclaims alleging trademark infringement and dilution. The district court granted an injunction and the court of appeals reversed, saying some very useful things about trademark that I hope they’ll remember in other cases. As usual, the conceptual tension between what gets said about First Amendment protections against confusion liability and what gets said about dilution was unaddressed, but that’s a small sour note. On the plus side, the Fourth Circuit resoundingly endorses Rogers v. Grimaldi, I think for the first time. The NAACP is the “oldest and largest civil rights organization” in the US, “and one that holds a place of honor in our history.” The Radiance Foundation is also a non-profit organization “focused on educating and influencing the public about issues impacting the African American community” from a Christian perspective. It runs two websites, TheRadianceFoundation.org and TooManyAborted.com, along with a billboard campaign for TooManyAborted.com. Radiance funds itself through licensing its artwork and through PayPal donations from visitors to its websites. Radiance posted an article criticizing the NAACP’s annual Image Awards, entitled “NAACP: National Association for the Abortion of Colored People.” The article “lambasted the NAACP for sponsoring an awards event to recognize Hollywood figures and products that Radiance alleged defied Christian values and perpetuated racist stereotypes,” and criticized other NAACP positions, particularly its ties to Planned Parenthood and its position on abortion. Contrary to the NAACP’s claims of neutrality on abortion, Radiance contended that the NAACP’s actions actually demonstrate support for abortion. The article appeared on Radiance’s site and the third-party site Lifenews.com. 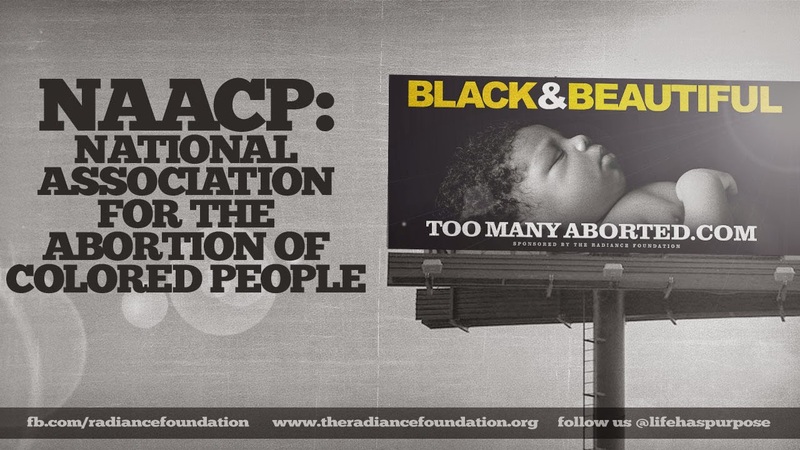 On TheRadianceFoundation.com was also an image of a TooManyAborted billboard with the headline “NAACP: National Association for the Abortion of Colored People” repeated next to it. TooManyAborted.com used a graphic below of a red box with the words “CIVIL WRONG” followed by the modified NAACP name. Adjacent to the article on both pages was an orange button with “CLICK HERE TO GIVE ONE-TIME GIFT TO THE RADIANCE FOUNDATION” printed around the word “DONATE.” On LifeNews.com, the NAACP’s Scales of Justice appeared as a graphic underneath the headline. This lawsuit resulted, and ultimately this appeal. The court of appeals began with first principles. “Much like advertising regulations that prohibit using false or misleading information, trademark infringement laws restrict speech in order to promote the government’s interest in protecting consumers from confusing misappropriations of product identifications.” [And dilution?] But this doesn’t impinge on the First Amendment rights of critics and commentators “so long as the Act hews faithfully to the purposes for which it was enacted.” The use of trademarks to convey ideas, criticism, comparison, and social commentary must be carefully protected, through the use of the canon of constitutional avoidance. Thus, an actionable use of a mark in commerce must also be “in connection with” goods or services in a manner that is “likely to cause confusion” among consumers as to the goods’ or services’ source or sponsorship. Thus, while the court did not hold that “commercial speech” according to First Amendment doctrine would alwaysbe coterminous with “in connection with,” it was the best guidance for applying the Act. [I take it the hesitation is in order to provide some leeway for another United We Stand-type case, so that the Lanham Act could cover nonprofits using confusingly similar names to fundraise.] “The ‘in connection with’ element in fact reads very much like a description of different types of commercial actions: ‘in connection with the sale, offering for sale, distribution, or advertising of any goods or services.’” Thus, “if in the context of a sale, distribution, or advertisement, a mark is used as a source identifier, we can confidently state that the use is ‘in connection with’ the activity.” Even the Second Circuit, which rejects noncommerciality as a complete defense, held that a crucial factor was use not as commentary, but instead as a source identifier for the infringer. Thus, a mere “strained or tangential association with a commercial or transactional activity” is insufficient, given the First Amendment risks. Okay, but then the Act is designed to cover a wide range of products, and “goods or services” “remains a broad and potentially fuzzy concept.” Thus, there must be “a real nexus” with goods or services to avoid a fatal First Amendment problem. Second, the use of a mark must be “likely to cause confusion” among consumers regarding the source or sponsorship of the goods or services. “Here it is important to remember that ‘trademark infringement protects only against mistaken purchasing decisions and not against confusion generally.’” There are lots of tests for assessing this “inherently fact-bound and context dependent” question, but one must always bear in mind that specific purpose. “When the infringer’s intent is something other than piggybacking off a mark holder’s success by tricking consumers into purchasing his goods instead, the other factors must be evaluated in light of that intent and purpose.” That might not change the factors, but it does influence their application. “For example, the strength of the mark and the similarity between the marks often work in reverse for cases of parody and satire as compared to a standard infringement case.” Similarity (as long as there are also differences) between a mark and a parody may only enhance the parody’s effect, and the strong mark’s strength is the mechanism by which confusion is avoided. Given this background, the district court erred in several ways. First [and this error was invited by prior Fourth Circuit precedent], the district court held that because the Radiance article appeared in a Google search for the term “NAACP,” it diverted “Internet users to Radiance’s article as opposed to the NAACP’s websites,” which created a connection to the NAACP’s goods and services. “But typically the use of the mark has to be in connection with the infringer’s goods or services, not the trademark holder’s.” If the rule were otherwise, “even the most offhand mention of a trademark holder’s mark could potentially satisfy the ‘in connection with’ requirement,” which would make it equal or surpass the jurisdictional “in commerce” element, making the jurisdictional requirement superfluous and threaten the First Amendment. the specific use of the marks at issue here was too attenuated from the donation solicitation and the billboard campaign to support Lanham Act liability. Although present on the article page, the Donate button was off to the side and did not itself use the NAACP’s marks in any way. The billboard campaign was displayed on a different page altogether. A visitor likely would not perceive the use of the NAACP’s marks in the article as being in connection with those transactional components of the website. Not all solicitations by nonprofits are categorically immune from Lanham Act liability, if there’s a sufficient nexus between the unauthorized use of the protected mark and clear transactional activity. “Such a nexus may be present, for example, where the protected mark seems to denote the recipient of the donation.” But here, the “in connection” requirement wasn’t met. Moreover, the full context diminished any likely confusion even further. The domain names and webpage headings clearly denoted other organizations: The Radiance Foundation or TooManyAborted, and each site carried dozens of articles on social and political issues. But even if a viewer only caught the title, “NAACP: National Association for the Abortion of Colored People,” the claim would still fail. “Titles, as part of expressive works, ‘require more protection than the labeling of ordinary’ goods.” Rogers. Consumers understand titles to refer to the contents of a work rather than its author or publisher. Under Rogers, if there’s a connection to the contents and no use in a way to clearly suggest authorship, use of a mark in a title won’t generally be confusing in the Lanham Act sense. Here, the title conveyed the subject of the article. The “satirical modification” of the NAACP’s name “was designed, as many titles are, to be eye-catching and provocative in a manner that induces the reader to continue on.” That didn’t create likely confusion. But Radiance’s speech fell plainly within the fair and noncommercial use exclusions. The fair use exclusion covers “[a]ny fair use, including a nominative or descriptive fair use,” and “including use in connection with,” among other things, “identifying and parodying, criticizing, or commenting upon the famous mark owner or the goods or services of the famous mark owner,” as long as it’s not a designation of source of the diluter’s own goods or services. Radiance used the NAACP’s marks to comment on what it deemed the NAACP’s policies. Even taking the title out of context, the use was still nominative, because it explicitly referred to what Radiance believed the NAACP stands for. Even if the use wasn’t a parody, it was still criticism or commentary, also covered by the exclusion. This entry was posted in commercial speech, dilution, first amendment, trademark. Bookmark the permalink.